When will an effective AIDS vaccine appear? We don't know, and almost nobody claims to know. But a vaccine is mandatory: Nothing else has slowed the AIDS epidemic, and people are dying by the millions. Granted, if HIV were as simple as polio, a vaccine would surfaced years ago. But Jon Cohen, a Science correspondent who just wrote the biography of the nonexistent vaccine (see "Shots in the Dark" in the bibliography), charges that organizational and political failures also hampered vaccine development. AIDS has not benefited from the same level of public or political support that propelled the war on polio. The March of Dimes crusade stressed that what it called "infantile paralysis" struck children. 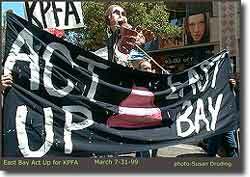 In the United States, AIDS afflicted first gay men, then intravenous drug users. Neither made ideal poster-children for the fight against the killing disease. Compared to the successful, coordinated drive by the March of Dimes to develop polio vaccine, Cohen says AIDS vaccine research "Is done by independent investigators who are always strapped for funds, are always driven by 'What can I publish next?'" The problem reflects the competitive nature of American science, where independent investigators write research proposals on whatever interests them. "There are many very positive aspects to the way things are organized," says Cohen, since unknown scientists can get funding with good proposals, but the AIDS crisis requires a more coordinated response. Cohen points to some promising developments in the quest. "The [National Institutes of Health] the world's largest funder of AIDS vaccine research, has revamped itself, tried to create tighter links with industry and academia. The International AIDS Vaccine Initiative has serious funding, has created better collaboration between science in poor and wealthy nations. So what's the big roadblock? These signs of progress, however, cannot immediately erase a legacy of chaos in vaccine development, which Cohen describes as being "in complete disarray." After 49 trials of 26 different vaccines (by the National Institute of Allergy and Infectious Diseases alone), he says "You can't compare the monkey studies, they use different strains of SIV to challenge, in some cases different monkey species, use entirely different protocols, different routes of challenge: intravenous, rectal, vaginal. At the end of the day the field is very busy, but their heads are spinning." Had the monkey trials been coordinated, the results might be grounds for guidance about approaches that should be pushed toward human trials. Sadly, Cohen charges, "No one has coordinated thse monkey research in a way that allows for rigorous comparative analysis." Comparative analyses are difficult to fund, Cohen acknowledges, and are often expensive and complicated, requiring cooperation among competing laboratories. "All of that is something that humans could wrestle with and coordinate, if they were all in this together. But they're not." And so, 17 years after the discovery of the AIDS virus, a vaccine remains just a hope, and researchers are still working more or less independently. "Cronyism not a huge problem," Cohen concludes. "It's sort of the opposite, it's kind of a free-for-all." Get help in our AIDS bibliography.